Tommy Chong, who played one half of the dope-smoking duo in the Cheech and Chong movies, was sentenced to nine months in federal prison and fined $20,000 Thursday for selling bongs and other drug paraphernalia over the Internet. The 65-year-old was allowed to remain free until federal prison officials tell him in a few weeks where he must report to prison. 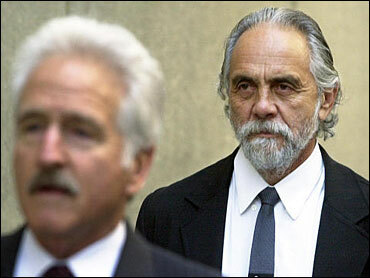 Chong also forfeited about $100,000 for his arrest on federal drug paraphernalia charges. He'll spend a year on probation after he's released from prison. His Nice Dreams Enterprises, which made a line of marijuana bongs and pipes, was to be sentenced later Thursday. Under federal law, the business itself can be placed on probation or face other sanctions. Chong pleaded guilty in May to conspiring to sell drug paraphernalia and pleaded guilty on behalf of Nice Dreams Enterprises, which did business under the name Chong Glass. The actor's plea came after federal Drug Enforcement Administration agents bought his paraphernalia and had the items shipped to an undercover business in Beaver Falls, northwest of Pittsburgh. Agents also confiscated his company's paraphernalia during raids of "head shops" in several states and confiscated "thousands of marijuana bongs and pipes" in a raid of his Gardena, Calif., business. His plea followed a series of DEA raids in February in which at least 55 people were charged with trafficking in illegal drug paraphernalia. Federal officials said the investigation targeted the nation's biggest Internet distributors of paraphernalia. Prosecutors said Chong was the first person to plead guilty in the raids. Chong and Cheech Marin co-starred in several films in the late 1970s and early '80s, including "Nice Dreams" and "Up In Smoke." There's no word on how this will affect Chong's reunion with Marin. The two reportedly have been writing a script for a movie. Chong recently had a recurring role on Fox's "That '70s Show."